After an extensive campaign effort, several endorsements, and what appeared to be vast community support, Santa Barbara County residents took to the polls on Nov. 6 and voted down a $75 million bond that would have funded facility improvements at Allan Hancock College campuses. "We are disappointed in the early results," Hancock President and Superintendent Kevin Walthers wrote in a statement released on Nov. 7. "The need is still critical for our students. We remain committed to helping our students succeed, but we will need to find ways, as a community, to support them with 21st century facilities and technology." 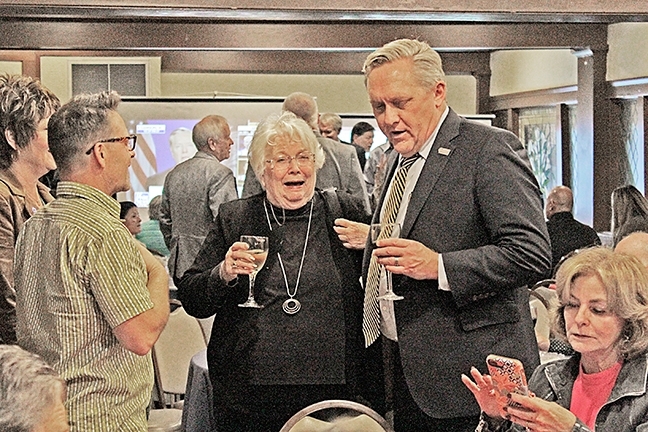 Allan Hancock College President and Superintendent Kevin Walthers (right) mingles at an election night party at the Santa Maria Inn on Nov. 6 while awaiting the first round of polling results to flood in. Hancock’s $75 million bond, Measure Y2018, was not approved by voters. The bond, which lost by about 10 percent of the total vote, would have been used at several of Hancock's campuses to build entirely new facilities and classrooms, make much-needed renovations to aging buildings–some that are 50 years old–and purchase updated equipment and technology. Greg Pensa, a Hancock trustee, said at an election night party at the Santa Maria Inn that many of Hancock's buildings haven't been renovated since he attended school there in 1969. Although he said the 2006 bond "transformed" Hancock's campus, there is still much-needed work to be done. "So it's critical that this passes," Pensa said before the first wave of results were announced at about 8 p.m., adding that he was "hopefully optimistic" it would be approved. In Santa Maria, Measure Y funds would have gone toward renovations to the athletic training rooms, fitness labs, locker rooms, and classrooms in the physical education facilities. Hancock would have also secured $24 million in matching state funds to replace its aging fine arts facilities. In the Santa Ynez Valley, Measure Y would have been used to buy equipment for the PCPA theater in Solvang and improve technology resources on campus. Improvements were also slated at Lompoc's Public Safety Training Complex. The bond would have cost the average Santa Maria homeowner about $2 per month, according to Lanny Ebenstein, education chair for the Santa Barbara County Taxpayers Association, who announced at a rally on Oct. 11 the organization's rare support for Hancock's bond. "We think the advantages that will come to Santa Maria and all of North County, Lompoc, and the Santa Ynez Valley will well exceed this investment," Ebenstein said at the rally. But Santa Barbara County voters didn't agree, and Hancock officials are back at the drawing board.